youth leadership and capacity for peacemaking and problem-solving in global conflict zones through the establishment of locally-run, youth-led music education programs. These programs provide local children opportunities for education, trauma relief, expression, and creativity and local teenagers opportunities to develop leadership, teaching, and expressive skills, to become role models in their communities, to access broader opportunities for education, and to reduce vulnerability to extremist group participation. 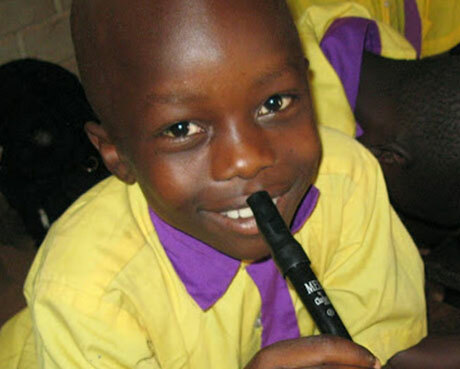 free musical instruments and instruction to former child soldiers and refugees in some of the world’s most war-torn locations: Uganda, Kosovo, Northern Ireland, and Syrian Refugee Centers. Since 1999, we have taught more than 17,000 young people that through music they can bring healing, hope, and peace to their communities. Our programs implement recommendations issued by the United Nations and UNICEF in their report on the “Impact of Armed Conflict on Children” (1996). 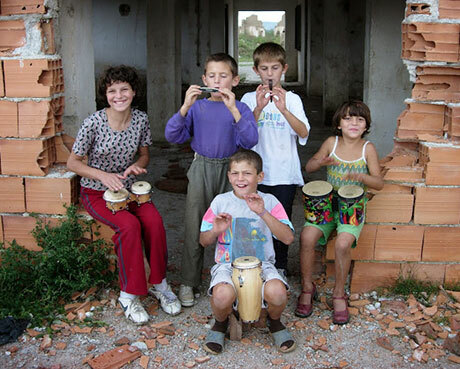 The report found that the most effective child war trauma relief programs provide “opportunity for expression and structured activities such as school, play and sports.” UN Expert Graca Machel cited music, theater, and arts education programs, especially those based in local culture. Our youth volunteer training programs also respond to UN and UNICEF findings on the acute war-related needs of adolescents. Among the documented results of our programming are significantly improved rates of secondary school completion and college attendance. Among our Kosovo youth volunteers, 100% complete primary and secondary school, as compared to fewer than 40% of children in Kosovo at large. More than 90% of our Kosovo volunteers go on to attend college, as compared to 33% of high school graduates across Kosovo.